Also known as single-zero roulette, the European roulette is composed of a total of 37, red and black colored pockets numbered from 1 to 36 plus zero which is colored in green. The purpose is to guess the pocket where the ball decides to come to a halt after the wheel stops spinning. 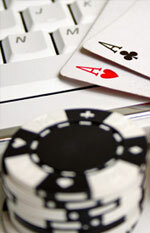 The rules are simple compared to other casino games. The bet can be placed on any outcome: a single number, a combination of several, one of the colors, odd numbers or even ones. The house advantage is smaller than at American roulette and the odds for the ball to hit one of the many numbers is 0.027%. The table has helping fields in which you can place inside or outside bets. You can choose whatever bet you want as long as it respects the minimum and maximum table limits. You can`t alter the bet after the wheel is in motion. Straight up bets - placing money on a certain number (1 number, not more) and expecting a 35 to 1 payoff. The Split bet - two consecutive pockets or squares, can trigger a 17 to 1 payoff. The Street bet- a line of 3 different numbers, where the payoff is 11 to 1. Line bet- players place 2 street bets that is a total of 6 numbers. Choose any line bet and the rewards will be 5 to 1. Cornet bet- placing money on 1 of the 4 existing consecutive squares. Choose any cornet bet and the rewards will be 8 to 1. The dozen bet- a combination of numbers between 1and 12, between 13 and 24, or between 25 and 36, meaning three square. Dozen bets are extremely rewarding, giving you a 2 to 1 payout. High & Low bets-from the second half of the numbers that range from 1 to 18 and from 19 to 35, two squares. Payout is 1 to 1. Odd and even bets- you bet on odd or even numbers. Payoff is ONE to ONE. Color Bets- red or black squares. Payout is ONE to ONE. There is also the En-Prison, which means that if when betting on odds, even or colors the ball stops on zero your bet is still on for the next spin. Your bet is captive. If it happens again you lose the money, if not you get your money back without a payoff. En-prison means the house has a low advantage (1, 35% which is the lowest) in case of even bets. The La Partage rule means 50% of your bet is lost and it will not be left captive.